It's nearly 50 years ago that my book of conceptual instructions Grapefruit was first published. In these pages I'm picking up where I left off. After each day of sharing the instructions you should feel free to question, discuss and/or report what your mind tells you. I'm just planting the seeds. Have fun. 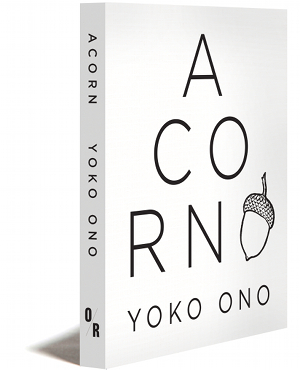 In Acorn, renowned artist and political activist Yoko Ono offers intriguing, enchanting exercises to open our eyes on better ways of relating to ourselves, each other, and the planet we co-habit. Throughout the book are drawings by Yoko, many never before seen. A portion of the proceeds from this book will be donated to the advocacy organization Autism Speaks. Yoko Ono is a Japanese artist and political activist, known for her work in avant-garde art, music and filmmaking. Her previous books include Grapefruit and An Invisible Flower (with Sean Ono Lennon). British Elle, June 21st 2013.